A Franklin resident stands atop a vehicle buried in a pile of rubble caused by Saturday’s tornado to hang an American flag Sunday afternoon. Rashawn Green, 18, of Franklin searches Sunday for salvageable possessions after Saturday’s storm destroyed his home. According to Robertson County’s Emergency Operations Center Coordinator Billy Huggins, the estimate was reached by going off appraised values in Franklin, and is expected to rise. 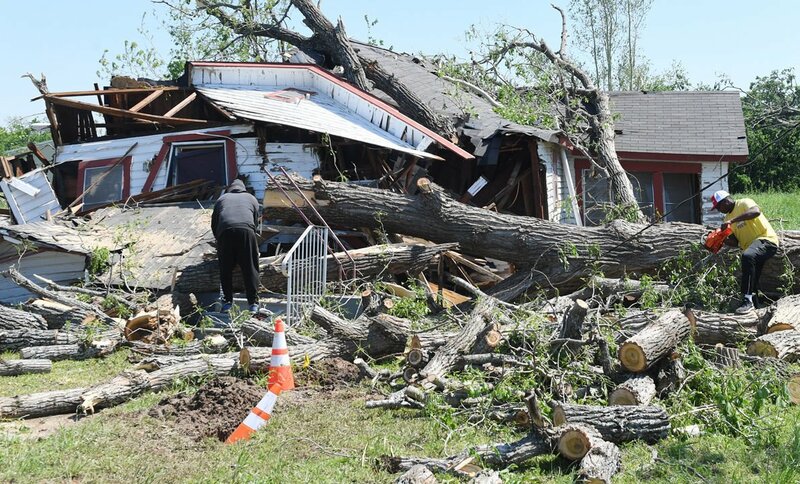 Huggins also confirmed 55 homes were destroyed, as were four businesses and two churches in the tornado, which had winds that reached up to 140 miles per hour, according to the National Weather Service. 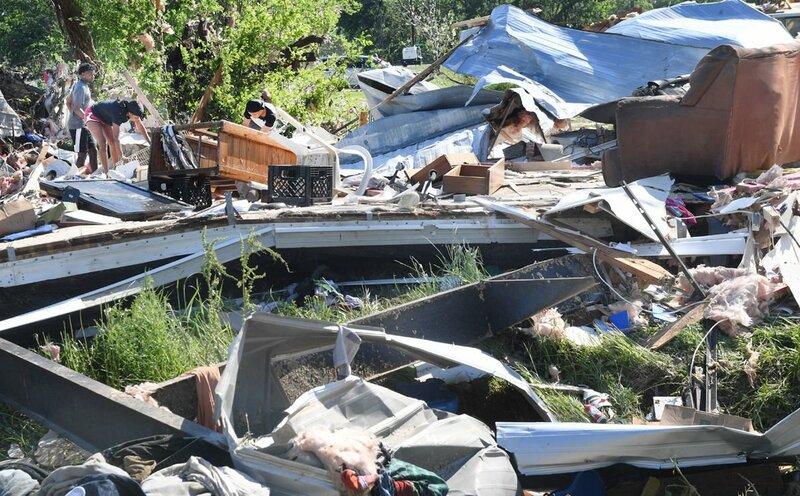 The NWS said Sunday afternoon that damage was received from the Milam-Robertson County line northeast to Buffalo in Leon County, though it was not immediately clear the number of tornadoes believed to have touched down. Late Saturday, the weather service said the storm that hit Franklin appears to have been an EF-3 tornado. Robertson County Sheriff Gerald Yezak said in a Sunday afternoon press conference that the McLennan County Sheriff’s Office allowed the use of their helicopter, which allowed him to fly the path of the storm. Yezak said the storm picked up a path just west of an area known as Red Hill, where it touched down and stayed on the ground. Yezak said the group saw where the tornado went into Leon County for a short distance before they lost track of it. No serious injuries were reported. Huggins said about 12 people were treated by emergency responders, and some had driven themselves to hospitals, so it was not possible to get a full count of those with injuries. Utility crews continue to work to restore power to the area, where about 4,000 customers remained with electricity in Robertson County on Sunday afternoon. Stuart Barrett, an official with Entergy Texas, said while the company is making progress, the restoration is a two-tier process. A transmission line was expected to be repaired late Sunday, which would restore electricity for most customers. A distribution center had the most damage, and Barrett said full restoration is expected late Monday. Because of the uncertainty of when electricity would be restored, Franklin schools will be closed Monday, as will Calvert and Bremond schools, officials said. A curfew of the affected area would be in effect again Sunday night beginning at 9 p.m. and would end at 7 a.m. today. Officials urged those who do not need to be in the affected area to stay away, and said law enforcement will soon be checking to ensure those in the area have a purpose. Huggins also stressed those seeking to volunteer to not just show up, but rather contact the Emergency Operations Center first, where names and numbers of those seeking to help are collected and then contacted on an as-needed basis. A notice to boil water before consumption has been extended to the entire city, officials said, and is not expected to be lifted for about three days while water is tested. Beginning at 8 a.m. today, water and ice for residents of Franklin and Robertson County will be distributed at the Pridgeon Community Center at 351 Cooks Lane, Huggins said. The American Red Cross has set up a shelter at First Baptist Church, and Huggins said once power is restored, the Red Cross expects all but one family being assisted to be able to return to their homes. The Red Cross will be doing damage assessment following Federal Emergency Management Administration guidelines and will be distributing disaster relief kits that contain items such as shovels, gloves and trash bags in the affected areas. Officials urged those cleaning up to not burn any items, but rather lay the debris on the curb separated into six categories: household trash, brush debris, construction and demolition debris, appliances, electronics, and household hazardous waste. An animal shelter had been set up north of Franklin at the AgriLife Extension 4-H Center, but Huggins said there had not been a need for the center. Those seeking help finding animals are asked to contact the Emergency Operations Center, as are those who live outside the city limits who have had home damage. The EOC can be reached at 828-6680. Huggins said though residents were grateful, donations of physical needs, such as clothing, had been met, and the city was becoming overwhelmed with the amount of items. Several fundraisers had been announced, including T-shirt sales by the Franklin High School Student Council. The group will be selling green T-shirts with the message “Franklin Strong” over an outline of the state of Texas for $10. Proceeds will be kept local and used to support families affected by Saturday’s tornado. The shirts are expected to be available Tuesday night, and the council will be setting up in the high school parking lot to sell the shirts. No pre-orders will be taken, adult and youth sizes will be available. Contact Shannon Groves at sgroves@franklinisd.net with questions. On Monday, the Rockdale High School baseball and softball teams will host the Franklin teams, and will “pass the hat” during the games to help with relief efforts in Franklin. Sunday Franklin residents came together to sort out the tornado rubble that covered several city blocks in the small rural community in Robertson County.